A mural in Lompoc, Santa Barbara County depicting a seaside Chumash village scene. Little of what Bill said made reasonable sense. He stood on the other side of his termite infested, dry-rotted, wobbly fence, which was missing slats and had gaping holes, saying that the reason he would not allow us on his property to view a Chumash pictograph panel was because he was protecting it. In the grand scheme of things, in a philosophical sense, he was correct. The art may be on his private property, but his life is short, fleeting, a mere speck in time relative the universe. Nobody really owns anything, by that measure, but are only temporary caretakers for the short period of time during which they exist on this planet. Ownership is a legal abstraction, a man-made concept that exists only in the human mind. A Chumash rock art panel in the Santa Barbara backcountry holding one of my all-time favorite design elements, which is seen here in the top half of center frame. Chuck took the lead in trying to break through the armor plated steely resolve Bill represented. From this angle and that angle he attempted to gain access but was met each time with steadfast denial. He tried this. He tried that. And it went on from there. What if we never tell anybody? No. What if we promise, take a solemn oath, never to post photos of the site online? No. What if we don’t take any photos? No. How about just a quick glance? No. No. No. Ten minutes prior to this fence line standoff, Chuck had spotted Bill in his driveway and approached him to ask if by chance he knew the location of the pictographs. We had been hopping around a pile of boulders, across the road from Bill’s house, looking for the treasure we had driven some distance to search out and find by way of a few scant clues. The boulders seemed an unlikely place, their location did not match the one telltale clue we had clung to all afternoon in our questing, but we were running out of ideas and so we checked anyway, and then Chuck saw Bill across the street. Bill had played dumb. “I’ve heard that there is supposedly some Indian rock art somewhere around here but I’m not sure where it’s at.” I had been laying a few yards away under the canopy of oak trees on a boulder in the shade, enjoying a brief respite from the heat and the previous few hours of fruitless hiking. Chuck had chatted with Bill for some five minutes before we hopped in Chuck’s car and returned back up the small residential lane a second time for a final attempt to locate the sought after site. A touched up version of the design element noted and shown in the previous photo. This is a redrawn image that enhances the design and relatively accurately conveys the general sense of the original artwork, but is not an exact representation. After some two hours, maybe three or more even, of hiking up and down and all around a fully exposed, all but shadeless, hot south-facing mountainside in the summer swelter, we had one last option to investigate. The option, like the boulder pile across from Bill’s house, did not match the aforementioned clue, and so we had not pursued it earlier, but we had no better ideas at this point. We headed downstream, or more properly described, down a small dry drainage channel that funnels runoff down the mountain during periods of significant precipitation. It seemed unlikely we would find here what we had already expended so much energy searching for, but it was our last hope before admitting failure for the day and heading home. Twenty to thirty yards down the narrow drainage, which held only minimal brush and a few stunted oaks due to so little annual rainfall, it opened to a flat beside the creek bed. There before us protruding from the hillside adjacent the creek was an outcrop. Bingo! This was it. This had to be it. We approached the site for a closer look onto what was obviously private property, and as we stood about conferring with each other, a man spoke to us from beyond the fence line. It was the owner. The same man Chuck had just spoken to face to face on the other side of the house and whom, bald faced, fed him a big ball of lies and pretended to know nothing. 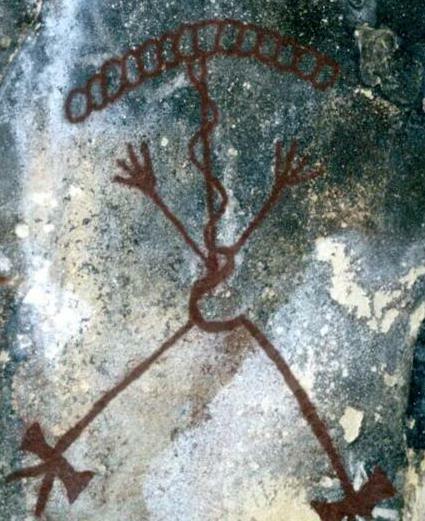 Later Chuck would say that he wouldn’t want to play poker with Bill, who had so well hidden the fact that he owned the rock art Chuck had stood before him inquiring about. 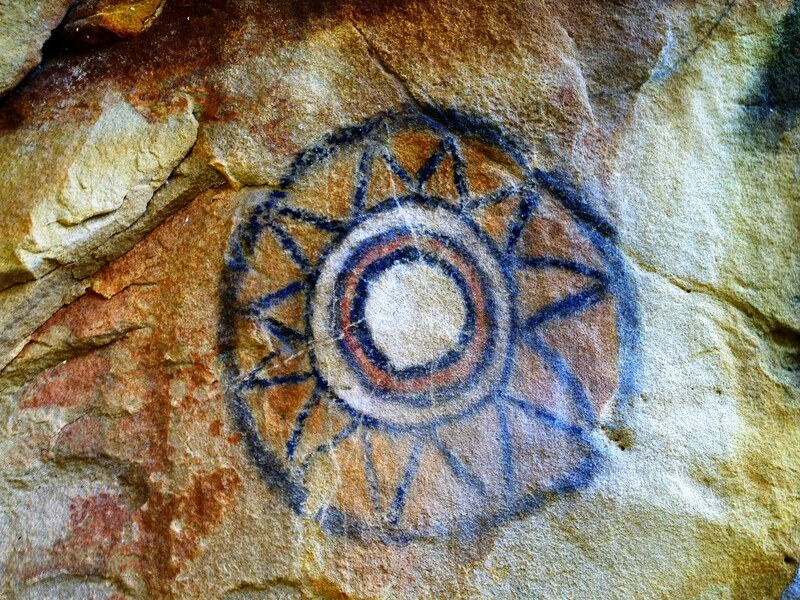 An exceptional Chumash mandala pictograph in the mountains of Santa Barbara County. “I feel bad,” Bill repeated several times during the lengthy over-the-fence conversation, speaking of his refusal to allow us a peek at the rock art. Yet he stood firm and would not relent. He kept insisting he was a protector defending the art and repeatedly justified his denial of our friendly requests on that basis. I understood his reluctance to allow strange men appearing at his backyard unannounced onto his property to view a rare, fragile and priceless piece of antiquity. I respected that, but what he was saying made no reasonable sense, and that bothered me more than his obstinate refusal. I don’t appreciate being taken for a fool, like a small child who lacks the mental capacity to reason and see through a patently absurd argument. We now knew exactly where this archaeological site was located. We knew his street address. We knew his name, and through various public records could find out a lot more about him. We could pinpoint the site location on Google satellite imagery and broadcast a map and GPS coordinates to the world, if we were so inclined. At this point we could tell anybody we wanted to regardless of whether he let us onto his property or not. There was nothing any longer to protect, because we knew where it was. The only way he would be protecting the art was if he allowed us onto his property and then we somehow tried to harm the art right in front of him and he forcibly stopped us, but that was a wildly silly idea. We just wanted to see it. 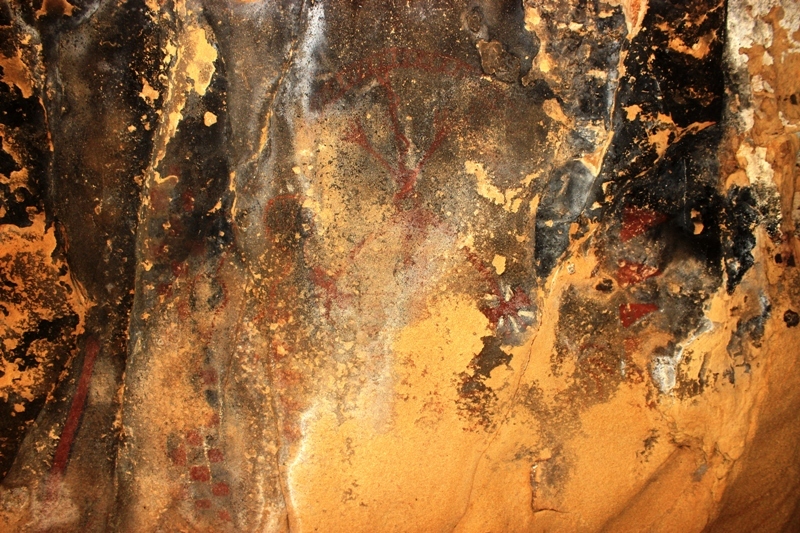 Chumash pictographs in the Los Padres National Forest of Santa Barbara County. I remained silent, though I wanted to let Bill know what he was saying was foolish, and that I well knew it. If he was willing to put up such a fallacious argument to justify his action, or was unable to see the falsity of what he was saying, then he would not likely be receptive to reason and so was a waste of further time. We left Bill, the great self-described protector, after failing to convince him to let us see the treasure he hardly kept hidden beyond his shoddy, rickety fence. For a man who so adamantly claimed to be a defender of the site, he sure put little effort into keeping it hidden and secure from wayward eyes. And we wondered what the dust kicked up from the dog we heard barking in his yard did to the art. We were kind and considerate and left on good terms. In the end, at least for me, as much as I wanted to see the pictographs, and as much as Bill’s lame excuse irked me, the fact that we were finally successful in locating the site, and did so on our last effort and after so much work, was a worthy reward in itself. The treasure hunt paid dividends even though we were ultimately denied the jackpot. Rock art in San Luis Obispo County. This entry was posted in Santa Barbara County and tagged Adventure, Archaeology, Art, Blog, Chumash, Native Americans, People, Pictographs, Rock Art, Santa Barbara, Travel, Writing. Bookmark the permalink. there must be some history there for him to be so skittish; tis a shame that you were denied the privilege to see the pictographs… i would have been so disappointed if i had gone to that trouble only to be turned away. i admire that you held your tongue and kept your honor intact. i hope that the man’s conscience made him sleep poorly! the imaged didn’t load with this slow internet, but i will return next week to enjoy what are surely treasures of history and art. images just loaded! i agree – your favorite pictograph is amazing! wow, how original and whimsical, and i am left wondering what it actually represents – or was the artist just having fun?! You may have to court him like a potential date. Send him flowers and some chocolates. Perhaps a movie and nice dinner? I’d have been very disappointed if I’d walked all that way and then not got to see the rock-art. $100 bill might have done the trick. I am a wanderer of these hills too. Just stumbled upon some wild “pictographs” in sandstone today in the Santa Ynez Mountains. An unbelievable site below it as well with a nice grinding rock and mano. Nice to see someone who understands this place! If you ever are in need of a hiking partner down near Ojai I am always willing to roll! Take Care! Because that would entail climbing over his fence and into his backyard. The legal implications should be clear enough. . .to say nothing of other concerns. . .
You may be surprised what a well-worded letter can achieve? I was able to visit a SB property once with a letter in advance. The lady actually called me and invited us.